Hello everyone! Thanks for dropping by my website! My name is Ryan Krane, and if you're searching for a certified Corrective Exercise Specialist (CES), you've come to the right place. My passion in life is to help chronic pain sufferers address and eliminate recurring body aches through expert-designed flexibility, posture, and strength training. The Krane Training Method ™, designed after years of working with clients tormented by various pains, encompasses the necessary training methods needed to successfully move better, feel better, and live better. I have my Master's Degree in Exercise Science with a concentration in Rehabilitation Sciences. This program focused on research and current issues in musculoskeletal rehabilitation and biomechanical assessment. This Master's program addressed evidence based science with courses in corrective exercise, exercise physiology, human movement and much more! The Krane Training Method ™ is custom tailored to fit clients' needs and lifestyles, making it one of the most accommodating corrective exercise programs available to relieve pain and improve quality of life! Learn more about this program by contacting me today. With many years of experience in fitness and health, I possess extensive knowledge and comprehension on techniques and exercises necessary to guide my clients on their path to achieve ultimate health. 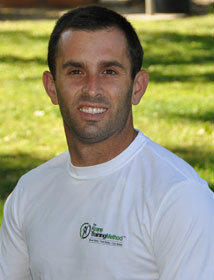 I started off as a certified tennis coach, strength & conditioning coach, sports nutritionist, and personal trainer. I've progressed to focus on corrective exercise in order to remedy chronic ailments such as back pain, shoulder pain, and other common body aches, which are so common today. Are you interested in training with me to eliminate chronic aches and pains? My clients enjoy learning and training with me due to my complete willingness and dedication to guide them to better health. I'm committed to making sure that all of our work together is pleasant and motivational - you're already suffering enough and you don't need a trainer shouting at you. When you work with me, you will reach your goals with ease and change your life forever! With corrective exercise training, I help return your body back into its perfect postural form, creating long-lasting physical ease that carries on throughout your life. Are you feeling up to the challenge? Are you ready to change your life for the better? Contact me, Ryan Krane, today to set up your first free fitness assessment and learn how I can eliminate your body pain for good.